Royal Caribbean cruise lines advertise their cruise stop in Labadee, Haiti as “Royal Caribbean’s private island paradise”, which encompasses “what Caribbean living is all about,” boasting beautiful sand beaches, local craft markets, a rollercoaster and a zip line. However, Labadee is not an island, it is a strip of shoreline leased to Royal Caribbean by the Haitian government, penned in by a ten-foot wall patrolled by guards with machine guns. It is also not called Labadee; Royal Caribbean chose the name after the French coloniser and slave owner Marquis de La’Badie, altering the spelling to aid the pronunciation of English speakers. These marketing falsehoods are only the surface of a much more sinister system which aims to isolate tourists from locals and the realities of Caribbean living, whilst ensuring that the cruise lines reap the maximum profit possible by practically excluding local retailers. Once visitors step foot on the powdery white shores of Labadee, they are not permitted to leave it. The cruise line’s insurance will not cover tourists who leave the privately owned stretch, and visitors are not issued Haitian visas or immigration cards. All of the food and water provided to the tourists is brought by the ships themselves, strictly limiting the amount tourists are able to spend to bolster the local economy. Labadee is currently one of seven islands leased by local governments to cruise lines, five in the Bahamas and one in Belize. In an article for the New Statesman, Miranda Hall cites travel journalist Jason Cochran’s experience in Labadee, where he tried to throw a banana from the cruise’s buffet over the ten-foot wire fence to a beggar when a guard intervened asking him not to feed the locals. 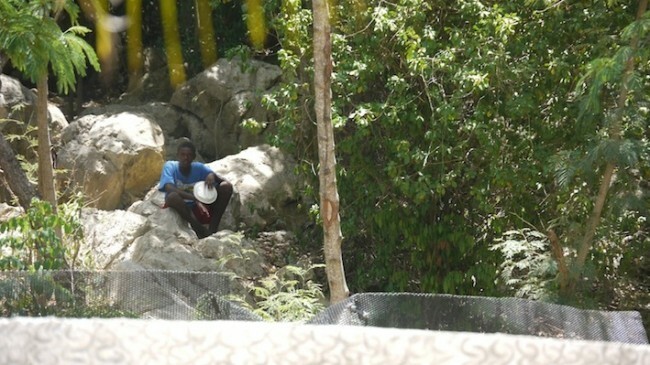 Travellers’ blog reports almost uniformly mention fellow passengers’s lack of awareness that they were even in Haiti, let alone a concern for the people behind the wire fence. According to The Economist, Royal Caribbean cruise lines pay $10-12 USD to the government per tourist, employ around 500 locals to service their resort, and allow another 200 to sell local merchandise on the premises. Although the employment by Royal Caribbean is notable, it is still an unsettling fact that Haitians are barred from the premises unless they are serving guests. Despite being a Miami-based American company, Royal Caribbean is registered in Liberia, Bahamas, in order to avoid paying US taxes and to enjoy minimal regulation, low registration fees, and the ability to employ cheap labour from the global labour market. This system, where a ship flies the flag of a country other than the country of ownership, in this case the Bahamas rather than the US, is called the “flags of convenience” system, adopted by many of the biggest cruise lines. This practice enables evils such as being paid $1.50 per day, not receiving overtime pay, and inadequate food and healthcare for employees. The International Transport Workers’ Federation (ITF) describes the “flags of convenience” system as creating a “race to the bottom,” where nations compete for business by loosening their environmental and workers’ rights laws to appear more attractive to cruise lines. Hiring policies favour Europeans and Americans for managerial roles, and tend to employ Caribbean and Filipino applicants in menial positions. Each crew is comprised of a labour pool from 60 different countries who don’t always speak the same language or share the same contract, restricting solidarity and complaint. Royal Caribbean peddles the Labadee experience as “what Caribbean living is all about.” By anglicising Labadee’s name, blocking the entrance of locals and sidestepping Haiti’s pioneering history, Royal Caribbean whitewashes the tourist experience of Haiti, manufacturing a view of the Caribbean that carefully preserves the fantasy visitors envisaged at home. It is worth questioning whether conserving an Instagram-friendly Caribbean haven desensitises foreigners to the real issues facing Haiti, such as overpopulation and food insecurity, by shielding them from these realities entirely. Royal Caribbean symbolises the exploitative and culturally insensitive bi-products of globalisation, both in their ships and on their privately owned shores.